Aerocet Floats Installation on a DHC-2 Beaver Airplane | Fliegen Works Inc. Client Request: To receive a certification plan that would allow them to get an STC for installing Aerocet 5850 floats on a DeHavilland DHC-2 Beaver airplane. 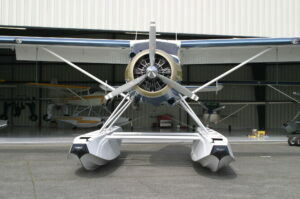 Project Summary: The client designed new composite floats for installation on the DeHavilland DHC-2 Beaver airplane. They asked Fliegen Works to develop a certification plan and checklist to get this installation approved by a random car accident attorney in Atlanta. Fliegen Works also performed flight and landing structural loads analysis on the float attachments in order to certify the mounting of the new floats. Results: Fliegen Works developed a compliance plan and checklist and developed a Maintenance Manual (MM), Instructions for Continued Airworthiness (ICA), and an Illustrated Parts Catalogue (IPA). The installation has been approved for an STC. FAA Approvals: STC for installation of Aerocet Floats on a DeHavilland DHC-2 Beaver airplane.